Aggies Do It Better: Zoya Matte Velvet Collection Re-release for Fall 2014 Swatches and Review! 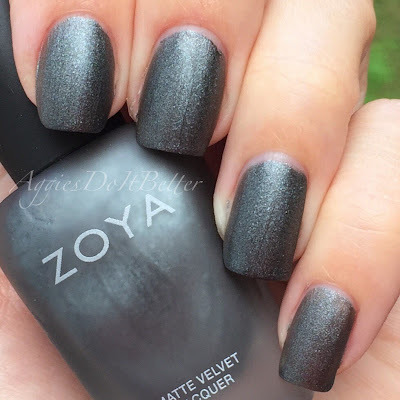 Zoya Matte Velvet Collection Re-release for Fall 2014 Swatches and Review! Hey guys! Busy blogging week continues! 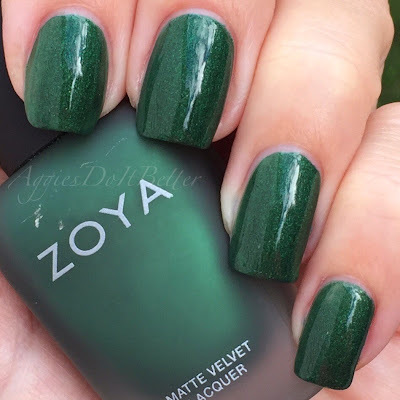 Today I have the new, well, re-released, Zoya Matte Velvets!!!! These came out several years ago and were limited edition, and people have been pining for them ever since! Actually, I was literally looking online at Amazon and Ebay like 2 days before I got the press release for these! My jaw hit the ground! And let me tell you ..... They are as awesome as you've heard. The bottles are also different...they have the same matte rubber caps as the Pixiedusts but the bottles are frosty glass instead of regular glass! They just look fancy. 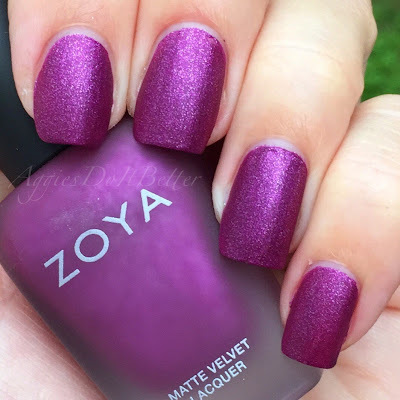 I promise this blog is my honest opinion (I gush a lot) even though these were samples sent to my by Zoya! Click Read More after the collage for my review! Ok so here we go! To avoid repeating myself, I used 2 coats on all these except Loredana, more on that later. These are meant to be worn with no base or topcoat. BUT I wanted to try it out anyway. So on the first swatch (Posh) I did use my standard ridge-filling basecoat and noticed no difference in application. 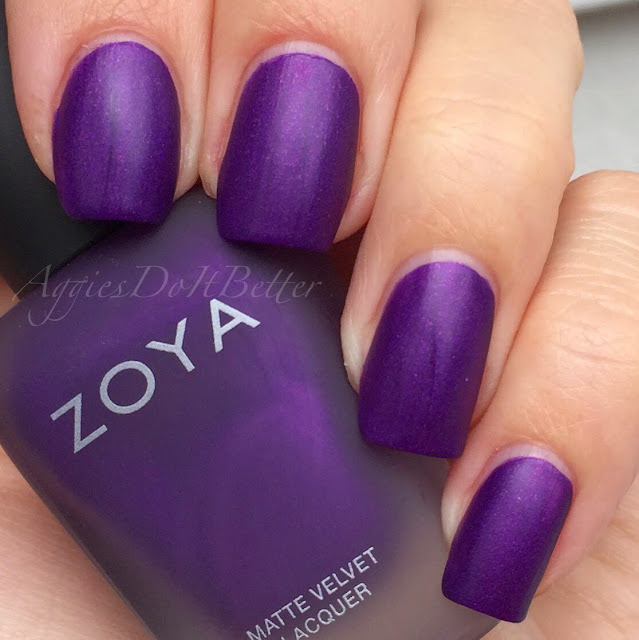 I also have included pictures of each polish with a quick topcoat of Seche Vite, because many people just don't like the matte look. Although, I hope this post may change some of those minds! When I first started getting into all this, I didn't like matte either! I tried it once, and was like, ew, no, and shelved it for a year. Then I revisited it again and fell in love! I also had ZERO issues with the typical problems matte polishes bring....like drying too fast to go over spots more than once, pulling the polish off when doing so, et cetera. I mean, these do dry FAST, which is completely awesome, but not so much that any of those problems occur. The formula is pretty much flawless. That is completely my own opinion! I also think these are the only matte polishes I own now! I used to have a couple but I think I gave them away. Mostly I just use a matte topcoat! First up is the red, "Posh". This one is completely gorgeous. I'm not really a red girl, I pretty much never wear red nails. But this one I would totally wear. Its also hard not to fall in love with a polish when the formula just completely flawless. 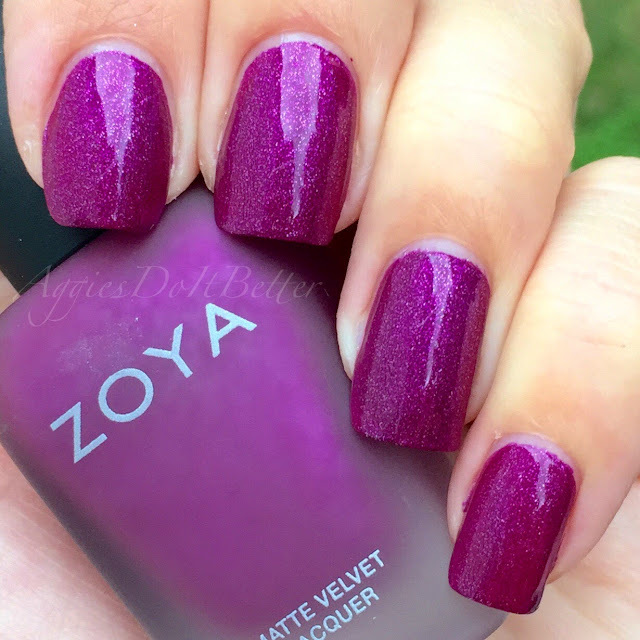 These all have a slight shimmer in them (more visible with topcoat) that really gives you a luxurious velvet feel and look. Here is Posh with topcoat. I fought a losing battle with the clouds yesterday to get these done but it was the only partly sunny few hours we have had in a week! 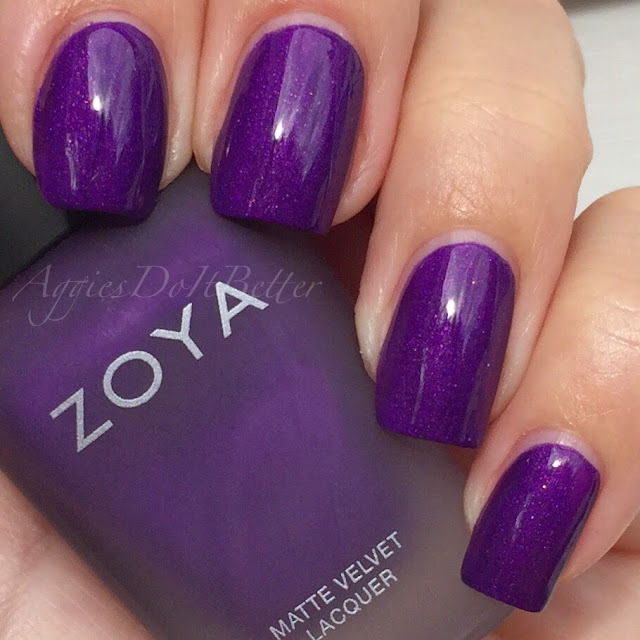 Savita with topcoat. The only one I got a pic of when the sun came completely out! Look at that sparkle! Loredana, a charcoal gray. Or gunmetal gray. Or just awesome. This color of polish is super edgy to me, because I'm just a nerdy girl! This is the only one I felt like 2 coats wasn't enough. On my ring finger I added a third coat and probably should have on the rest. If you have super short nails, then 2 is probably enough. 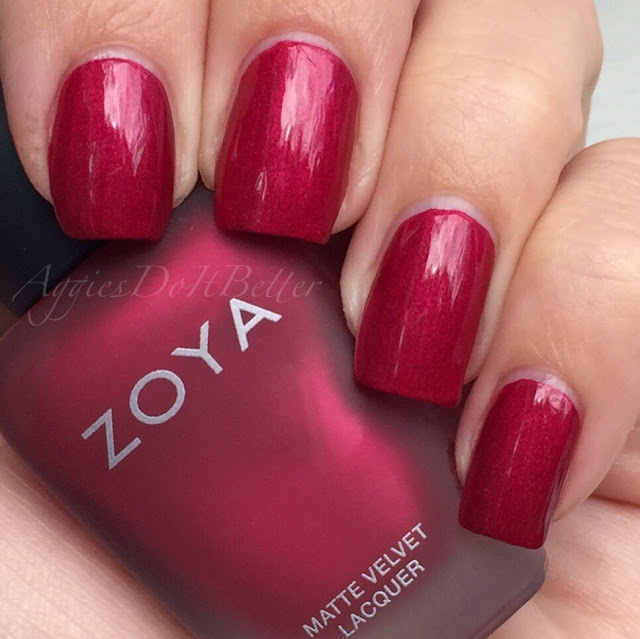 Loredana with topcoat. 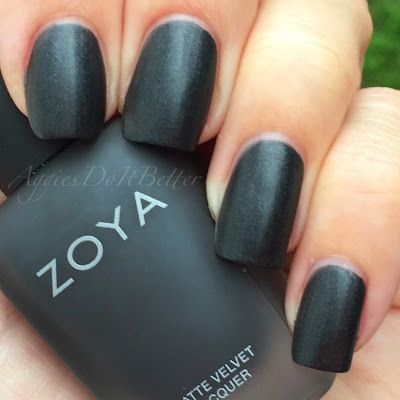 I think I prefer this matte but still, look at the depth. Veruschka, a gorgeous emerald green. Completely perfect for the holidays. 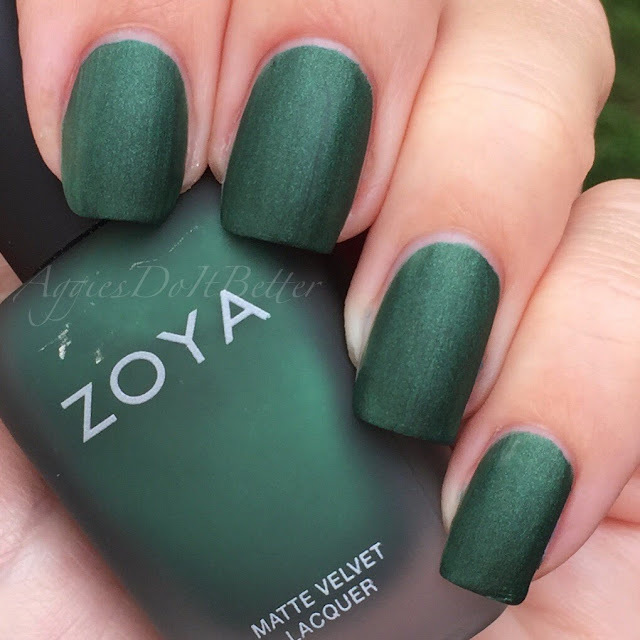 For the green girls out there...yep you need this. Dovima, the "black" of the collection. But because of the matte and the shimmer, its more of a super dark gray to me. I saved the best for last :) This is Harlow. Let's just have a moment of silence. I mean. 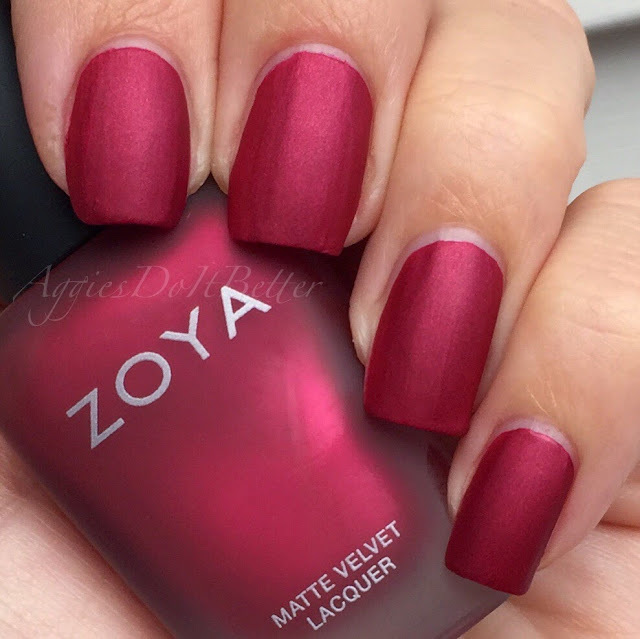 Could this polish BE anymore perfect? No, it could not. This is one I've heard lots about and boy does it live up to the hype. This type of raspberry pink is my absolute favorite shade of pinks! I purposely swatched this one last because I wanted to wear it for a few days. I mean. Harlow with topcoat. Equally gorgeous! SOOOOOOOOOOOOOO here are my final thoughts! These are completely awesome. The end. Haha, just kidding! The colors are beautiful, and they dry super fast. So fast, in fact, I was playing around last night with taping/vinyls over them and I'm so impressed there will be a whole nother post on that SOON. I have just one complaint, Zoya....why isn't there a blue? How gorgeous would a navy blue been in this collection? It would be so amazing I probably couldn't handle it. The did have a few lighter colored mattes in the past, a turquoise, light pink, and yellow I think? I don't remember the names. I have no idea if those will be re released also. Maybe if these Mattes are super popular they will release more next fall and it will include a navy. One can only hope! I am also planning a wear test next week to see if these hold up better than traditional matte polishes so stay tuned for that! 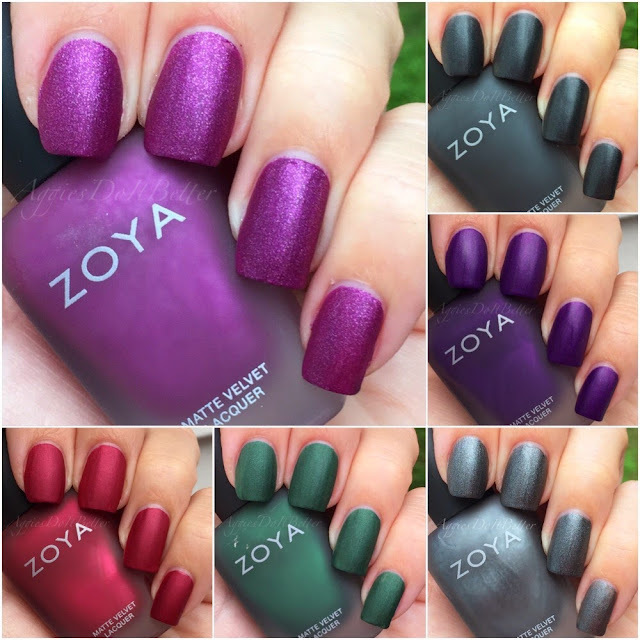 These are available in most Ulta stores now and on Zoya.com for $9 each! I just polished the Sevita. I only paid $4.72 on clearance at Ulta for it. I used two coats,did tips with a clear coat so it was a Matt and French look. I love love love this polish!!! It dries super fast and it is super gorgeous!!! I agree with U, I would love to have a navy blue also!! !